The Starlight is our full-sized Concert Grand 47-string pedal harp, with a precision mechanism made in Switzerland. It is strung with Premier Gut Strings, D’Addario nylon uppers, and tarnish-resistant bass wire strings. The voice of this harp is even throughout the range, from a strong, powerful bass to a clear, resonant upper register. The Starlight possesses the same durability, stability, and other advantages of all our carbon fiber harps. Most concert grand pedal harps in the world weigh between 84 and 100 pounds. 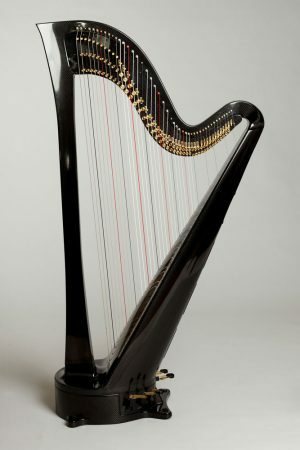 The Starlight weighs an astonishing 38 pounds, making it even possible to carry Starlight by its column, in the horizontal position, the way many lever harp players carry their harps. The Starlight opens up a whole new world of harp playing.